Not sure what to get? Gift cards available! 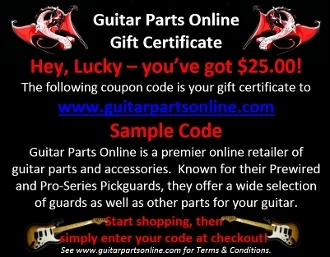 Treat yourself or grab one as a great option for the musician in your life. Available in a variety of amounts. Want a gift certificate in another amount? Just contact us - we can accommodate certificates in any amount. We'll send you a gift card coupon by email suitable for e-gifting. You or the lucky recipient can simply enter the code at checkout to have the amount of the gift certificate deducted from the order total. Be sure to check out Gift Card Terms & Conditions if you have any questions, or just contact us for any additional information you may require.